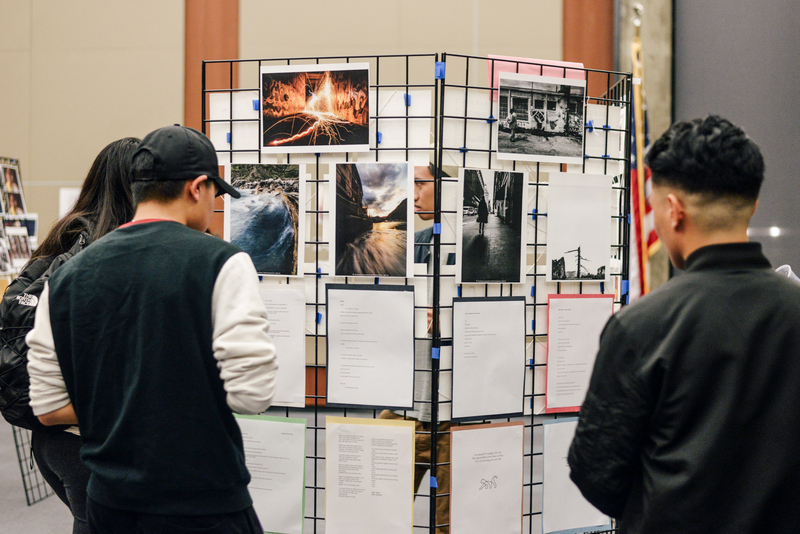 Room 220 in the Julian A. McPhee University Union will be filled with artwork made by Cal Poly’s Pilipino Cultural Exchange (PCE) Saturday. Ito Ako, the name of the PCE art gallery, is Tagalog for “this is me,” explained animal science sophomore and co-Outreach Coordinator Angelica Macalisang. PCE is a cultural club on campus open to all students, not only those who identify as Filipino. The club aims to teach and share cultural perspectives among peers in engaging ways, business administration sophomore and co-Outreach Coordinator Govind Rasmi said. Rasmi, who is not himself Filipino, was drawn to the club’s familial atmosphere and performance groups. The idea behind the art gallery is not only to showcase student art, but to provide Filipino students, as well as other students, with an outlet to express themselves. “We just want to make pieces that showcase who we are, because that isn’t always expressed in media … People of color are either misrepresented or underrepresented and this is a chance for us to show who we truly are in our own art gallery,” Macalisang said. The theme of the art gallery this year is “Aking Pamilya,” which translates to “my family” in Tagalog, according to Rasmi. Rasmi submitted an art collage showcasing a series of pictures from the many times he has visited family in India. The colors he uses in his art piece, he explained, represent the Indian flag and the pictures he chose show his heritage through an in-depth perspective. With family and self-expression in mind, students were prompted to create art to show that their culture is more than just a single story or stereotyped view. To promote the upcoming gallery and encourage submissions, PCE’s web, media and marketing team hosted an art workshop where PCE members could gather, eat and create. Although this year is the second year the gallery will be showcased, it is the first year PCE hosted a workshop for the event beforehand. “Me and my ‘co’ really thought this workshop will help people really hone in on what they want to represent at Ito Ako” co-web, media and marketing coordinator and architecture sophomore Reii Nelle Del Campo said. The Ito Ako members hope the event will continue to spark curiosity among students for the many cultures on campus. After the event, Rasmi said there will be an open mic night for all who would like to participate. More information is available at the event’s Facebook page.